Enjoy some good food and get a jump on your Christmas shopping! Westside Tailgate Farmers Market is sponsoring a Fall Craft & Food Market on the first Thursday of each month this fall—September 5, October 3, November 7, and December 5—4:00-7:00 pm. 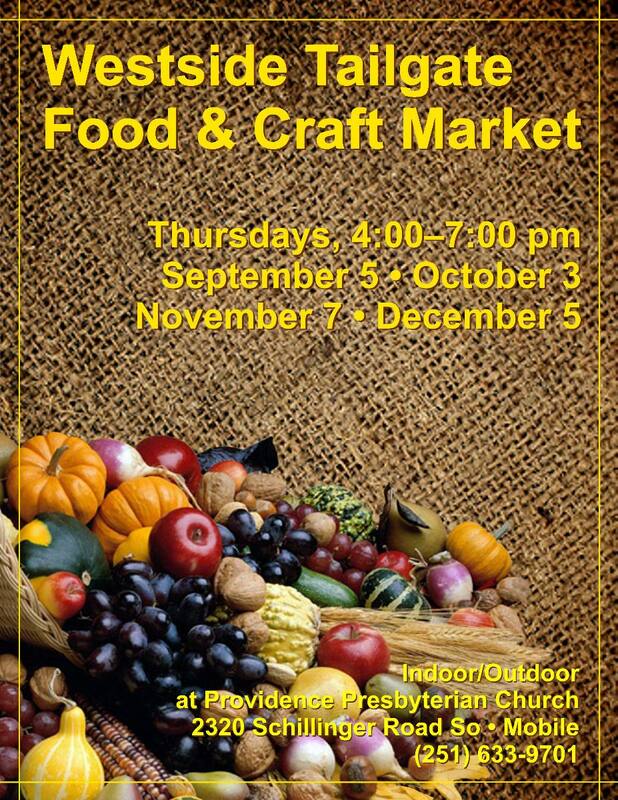 The Market is located at Providence Presbyterian Church (3270 Schillinger Road S)—rain or shine (if it's raining, we'll be inside the church). We have crafters, artisans, bakers and, of course, farmers with fresh, local creations and produce to offer throughout the fall. Many of our regular vendors will be in attendance. "Like" the Westside Tailgate Farmers Market Facebook page to receive regular updates. Note to Potential Vendors: We'd love to have you join us. Just fill out this form and email or send it to the church, so we can reserve a space for you. There is no charge.